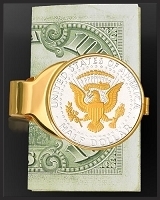 Presidential seal half dollar coin highlighted in pure 24kt gold, spring-loaded money clip. America's most beloved President, John F. Kennedy, has been memorialized on the U.S. circulation half-dollar since 1964. JFK’s high threshold of achievement redefined America through leadership rarely witnessed. The coin's reverse, the Presidential Seal of the United States, is enhanced in precision 24K Gold and protected with our exclusive Lenscote. 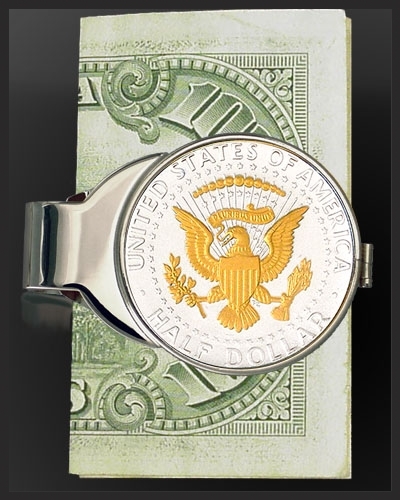 The hand polished stainless steel money clip and features a patented spring action that holds even a single bill snugly. Pick the coin date most significant to you. 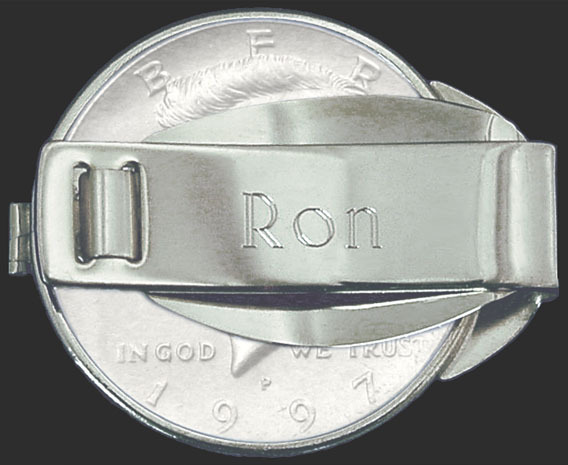 I purchased this for my brother with his birth year on the coin and his initials etched on the back. It is so beautiful! I love love love it! It arrived very quickly too. He just texted me to thank me again for it. This is a great gift! !